Value management and pricing strategy consultant Steven Forth explains how to achieve a potent, irresistible B2B pricing formula by aligning economic and emotional value along the technology adoption lifecycle. Getting emotional and economic pricing factors to work together is the black magic of B2B pricing. Both are important and both come together in the customer’s willingness-to-pay. Willingness-to-pay is something pricing experts talk about a lot. Some people, especially those focused on optimizing pricing by analyzing historical transactions, see willingness-to-pay as something out there to be discovered through data analysis — the modern equivalent of the market price. The goal of pricing experts is to segment the market by willingness-to-pay and then optimize prices for each segment. 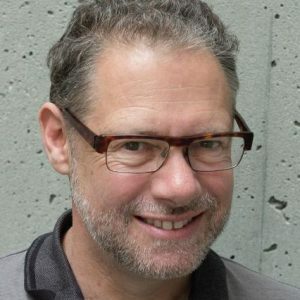 Those who follow value-based pricing argue that willingness-to-pay is actually based on perceived value, and that by changing the perceived value, or simply by communicating your value more effectively, you can change willingness-to-pay. Perceived value — what is that? Well, that is where economic and emotional value come together to shape willingness-to-pay (for more detail see the post “You Can’t Price Software Without Focus”). Naturally, more economic value increases willingness-to-pay. 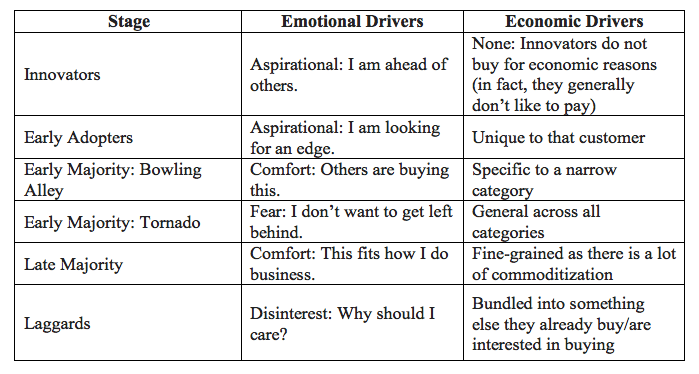 But what some companies don’t realize is that economic value drivers often only have a real impact when they combine with an emotional value driver (see below). For example, when corporate focus is on cutting costs (as it is during an economic contraction) you can talk all you like about how you will increase revenues, but no one will hear you. You are not fulfilling an aspiration. You are fighting indifference. That is not a battle you want to fight. 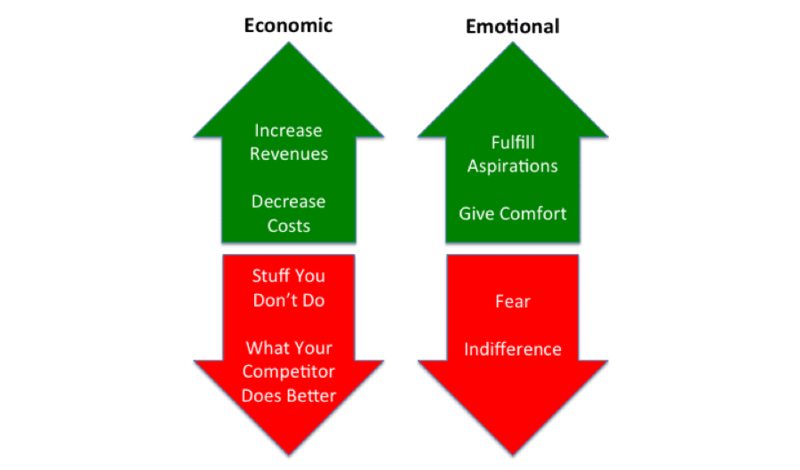 Emotional filters decide what economic messages your customers will pay attention to. You have to address their fears and aspirations, which tend to change depending on the stages in Geoffrey Moore’s technology adoption cycle (see Crossing the Chasm). These changes in the key emotional and economic drivers are the main reason pricing is so difficult in the early stages. Innovators will use your cool new thing because it is bright and shiny. They probably won’t want to pay for it though — they are not looking for economic value, they want to be ahead of the curve and in the know. They matter because the sharpest early adopters use them as signal detectors. Examples can be very industry specific and often include consultants, certain analysts, research labs at large companies and, yes, your competitors. Experiments with new technologies also come to play here. Key pricing tactic for innovators: Don’t try to capture price. Early adopters buy because you give them an edge over their competition. If many other people are already using your offer you are not giving them an edge. They are willing to pay for that competitive advantage, as well. You need these people to help you shape your offer, but be careful — the price in early-majority markets is likely to be significantly lower than what early adopters are willing to pay. Two specific examples of early adopter solutions could be value-based pricing software at speciality chemical companies, or precision agriculture at stone-fruit farmers. The challenge for these types of innovative solutions is crossing the chasm. Of course, many get stuck never fully catching on past early adopters. Key pricing tactic for early adopters: Price as high as possible. The early majority in the bowling alley represent your beachhead as you cross the chasm. These are critical early clients and they pose real pricing challenges. They tend not to reference early adopters (“Oh, you know Lynn at Cool Corp, she buys all sorts of weird stuff.”), and are very focussed on economic value drivers specific to their industry. You have to make them feel comfortable with you by speaking their language and by pricing in ways that support their own value models and pricing metrics. One example of a group of solutions currently in “the bowling alley” are conversion optimization (A/B testing, content effectiveness) tools. Key pricing tactic for this early majority: Price relative to segment-specific value drivers. Align your pricing metrics with these value drivers and with the business model of your clients. This is where we all want to get — where customers are buying because they feel they have to or they will be left behind. Value drivers flip from the being targeted on industries to being general across wide swaths of business. Two examples of solutions in this phase include marketing automation tools and social media monitoring software. Key pricing tactic for this early majority: Price based on the value drivers that cross the largest number of segments (and manage discounting carefully). The late majority largely consist of customers who may already have a solution and are now looking for something that is cheaper and better designed for their specific industry. General value drivers are largely commoditized and companies are looking for solutions targeted at their specific business problem. Examples of solutions that have reached this point are ones in the Customer Relationship Management category. Key pricing tactic for the late majority: Go back to niche specific value drivers and price to dominate the niche. Laggards can be customers who prefer not to buy technology-enabled solutions and will generally only buy if the technology is wrapped up in something they already understand. As an early-stage company you are probably not selling to customers in this category as you have neither emotional nor economic appeal that will speak to them. Your best bet is to land a deal with a company that already sells to these markets and package your technology into their product or service. Think of your uncle who does all of his bookkeeping in a ledger, but who uses an accountant who does his taxes online. Key pricing tactic for laggards: Bundle your technology into some non-technical service, but still price to capture the value you create. 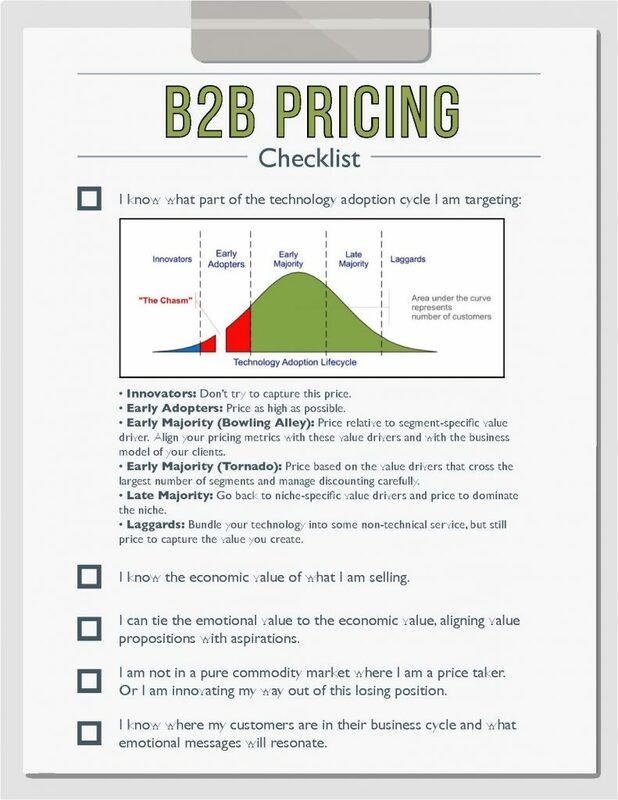 Here is a simple checklist to use as you work on your pricing that utilizes the categorization and insights above (click to download). You Can’t Price Software Without Focus: Picking a number is actually the last step in a successful pricing process. Steven breaks down what you need to do first. Read more. The Secret to Boosting Your Software Pricing Power: Steven explores the surprisingly powerful role emotion plays in setting the right price for your software. Read more. The Ultimate SaaS Pricing Resources Guide: Getting pricing right is one of the most difficult — and important — challenges a SaaS company faces. In this guide you’ll find the best resources available to help you determine your ideal pricing model. Read more.